Barney Oldfield was a pioneering auto racer. 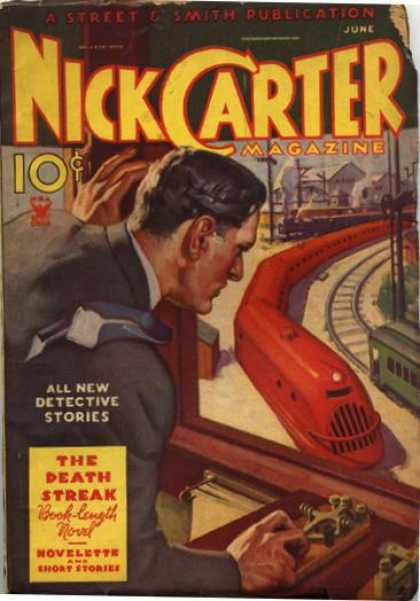 The Golden Egg, also known as the Golden Submarine, was an early effort at streamlining. The car was designed by Fred Offenhauser and Harry A Miller, who both became famous racing car builders. Except for the skinny tires and spoked wheels, it looks remarkably modern. The "outlets" (windows) were covered with screens because he couldn't get rounded glass. Glass all around could also have been dangerous. From the 22-July-1917 New York Tribune. Click on the image for a much larger version. 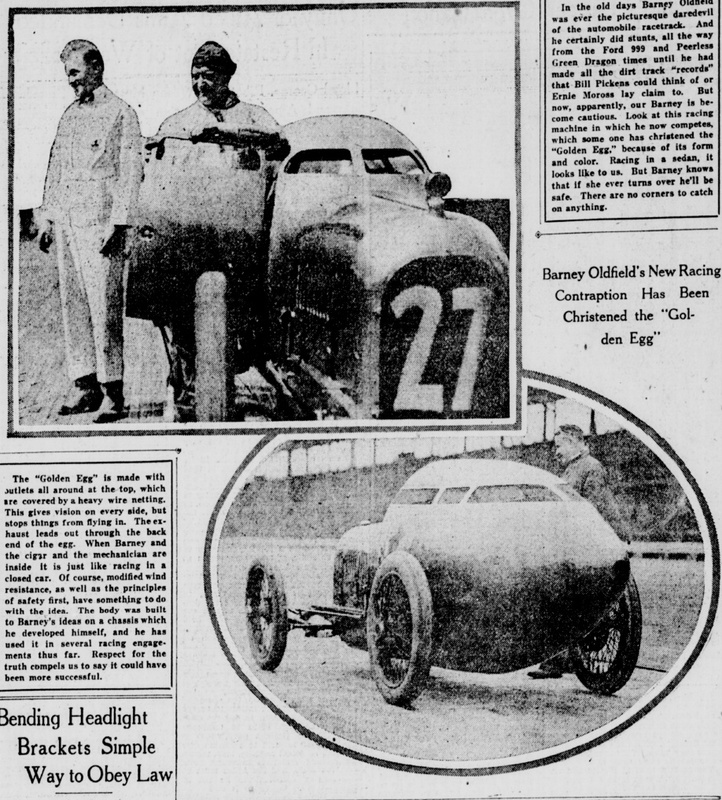 Barney Oldfield's New Racing Contraption Has Been Christened the "Golden Egg"
In the old days Barney Oldfleld was ever the picturesque daredevil of the automobile racetrack. And he certainly did stunts, all the way from the Ford 999 and Peerless Green Dragon times until he had made all the dirt track "records" that Bill Pickens could think of or Ernie Morosa lay claim to. But now, apparently, our Barney has become cautious. Look at this racing machine in which he now competes, which someone has christened the "Golden Egg," because of its form and color. Racing in a sedan, it looks like to us. But Barney knows that if she ever turns over he'll be safe. There are no corners to catch on anything. The "Golden Egg" is made with outlets all around at the top, which are covered by a heavy wire netting. This gives vision on every side, but stops things from flying in. The exhaust leads out through the back end of the egg. When Barney and the cigar and the mechanician are inside it is just like racing in a closed car. Of course, modified wind resistance, as well as the principle of safety first, have something to do with the idea. The body was built to Barney's ideas on a chassis which he developed himself, and he has used it in several racing engagements thus far. Respect for the truth compels us to say it could have been more successful. Chester Conklin, sometimes called "Walrus" because of his moustache, had a long career in slapstick comedy. After playing in vaudeville, he joined Keystone and appeared as a Kop and supporting player. After working his way up to lead roles, Chet left Sennett in the usual contract dispute. 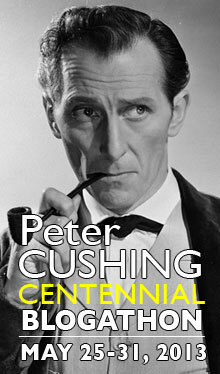 He played in short comedies and supporting roles in features throughout the Twenties. 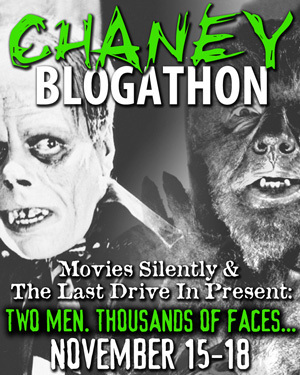 He was teamed with WC Fields in a series of Paramount silents. He continued to work in small parts in the 1930s and 1940s. He died in 1971. From the 13-November-1898 San Francisco Call. WA Coulter did many maritime drawings for the newspaper. 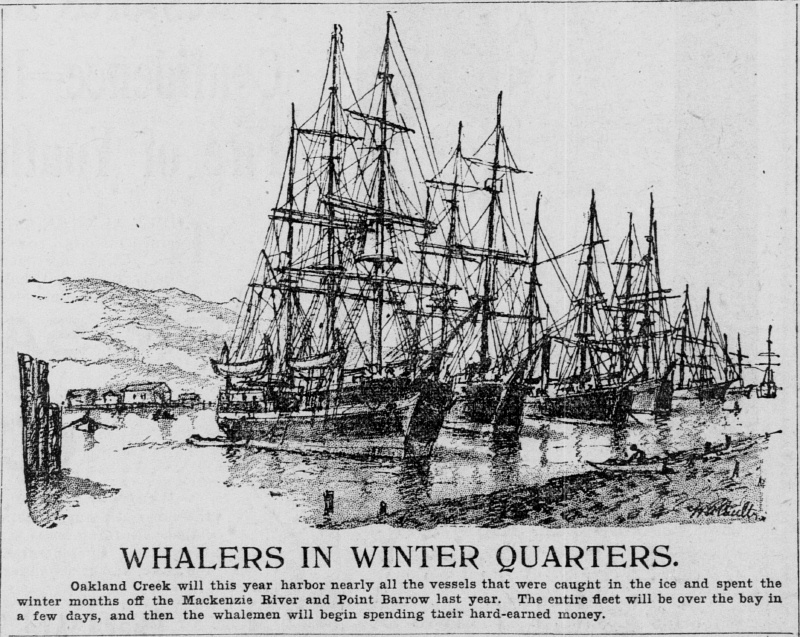 Most of the American whaling fleet wintered in San Francisco Bay, especially in freshwater Richardson Bay, where marine borers could not attack the hulls, which were often not sheated with copper. I took the photo on 23-September-2010. I took this photo of the Hearst Building at Third and Market Street on 18-December-2008. 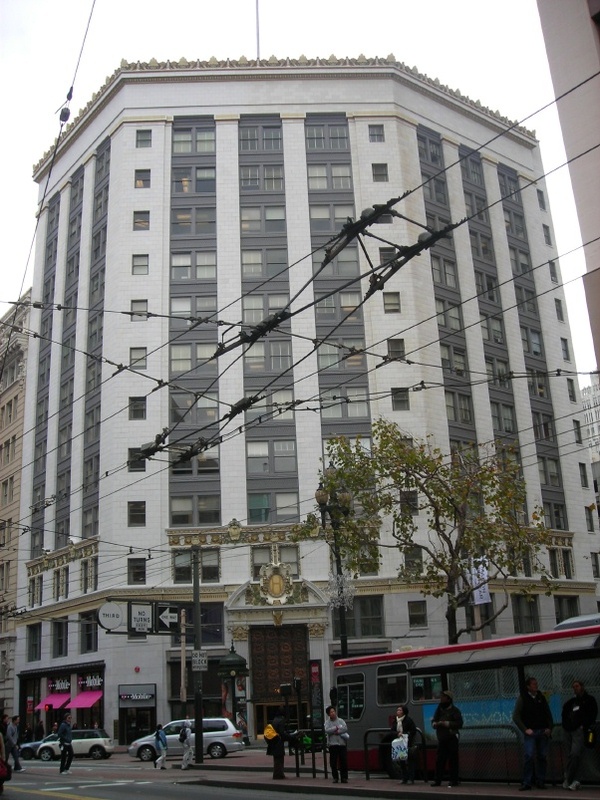 The former home of the San Francisco Examiner, this building also housed Hearst radio station KYA from 1934 to 1948. Last week while driving home, I heard a station id on Q-FM and I thought the announcer had given different call letters. I listened every day after that and finally heard another station id. The new call letters are KARC. I don't know why or when they changed. 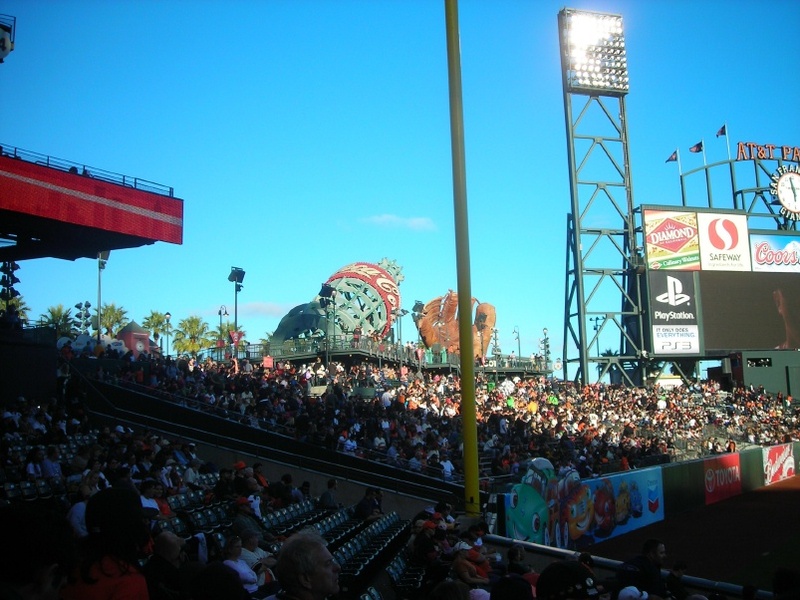 Yesterday we went to the 2010 Fiesta Gigantes, where the Gigantes were playing the Milwaukee Cerveceros. We parked at Daly City and got on a four-car train which picked up many people dressed in orange and black. We got off at Embarcadero Station and found that the new fare machines and gates were working. We bought three Muni tickets, each for $2.25 ($2.00 fare, $0.25 insurance). There was a Muni person standing by the gates explaining how to use the Clipper card. When we got to the top of the escalator, we saw that the platform was jammed. If we hadn't paid, we would have walked. A Muni person told my wife that she was amazed there were so many people. Being in first place will do that. We managed to get on the first S-Shuttle, but it was tightly packed. At the ballpark, we walked all the way around the outfield, then bought dinner at one of the stands near the bleachers. Carlos Santana got an award before the game and plugged his new album. The weather was muggy throughout the game. I dressed too warmly. Lincecum had problems again, but pitched well. Unfortunately, the Giants lost 2-1. I was surprised that a boat spent several innings behind the flags in right field. It was flying a large US flag and had a banner that said "Free Johannes Mehserle." Coming home, we got on an N-Judah pretty quickly, and then caught a 10-car BART train. We were able to get a seat on BART. Today they won and the Padres lost, so they are back in first place. 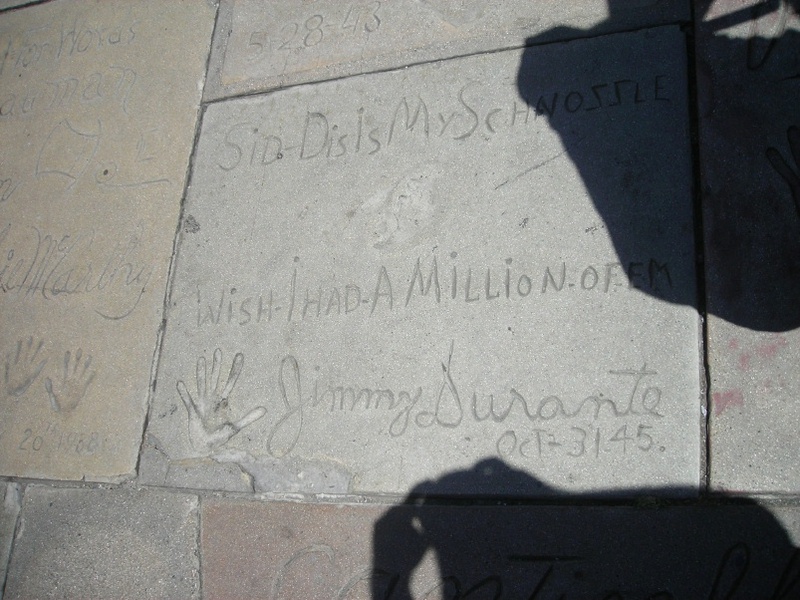 Beloved performer Jimmy Durante left hand and schnozzola prints in the forecourt of Grauman's Chinese on 31-October-1945. Jimmy began his show business career as an excellent ragtime pianist. He was a member of an early New York jazz band, the Original New Orleans Jazz Band. He went on to star in vaudeville as a singer and a comedian. Over the years, he starred in radio, movies, and television. He was famous for many catch phrases including "Ha-cha-cha-chaaaaaaa," "Dat's my boy dat said dat," "Everybody wants ta get inta the act," and "Umbriago!" DSCN4150. I took this on 18-July-2009. 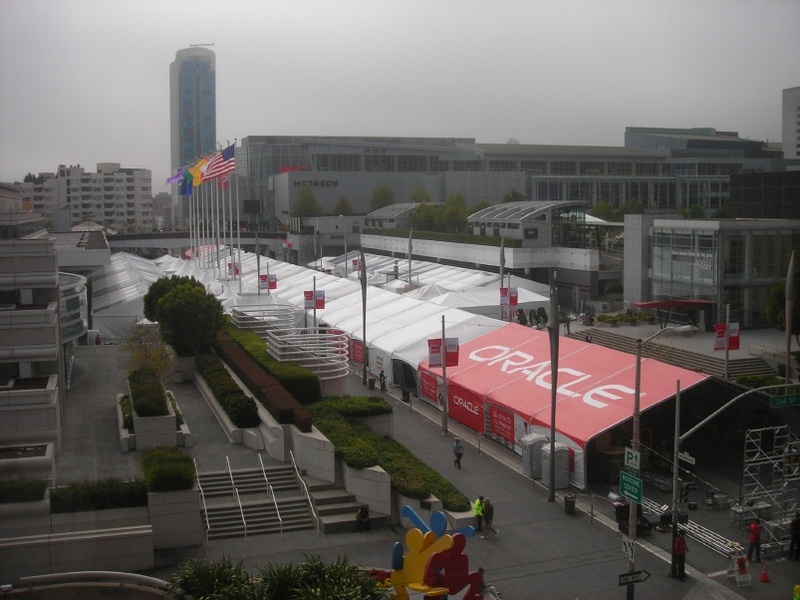 Yesterday Oracle Open World started setting up its tents on each side of Howard. Last night at 8pm, they closed off Howard between Third and Fourth. This morning, the big tents were up. Traffic wasn't too bad. I didn't hear many honking horns. It was muggy today, and very cold at lunch time. Today was Parking Day. I only saw one park, on Howard. The Waterless (air-cooled) Knox automobile was manufactured in Springfield, Massachusetts. I like the name Waterless Knox. It reminds me of a Doctor Seuss character. As I mentioned in an earlier post, how many car ads today would use the word "obviate"? 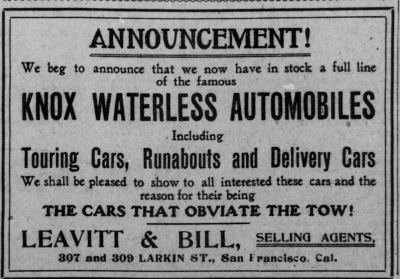 This ad is from the 01-May-1904 San Francisco Call. 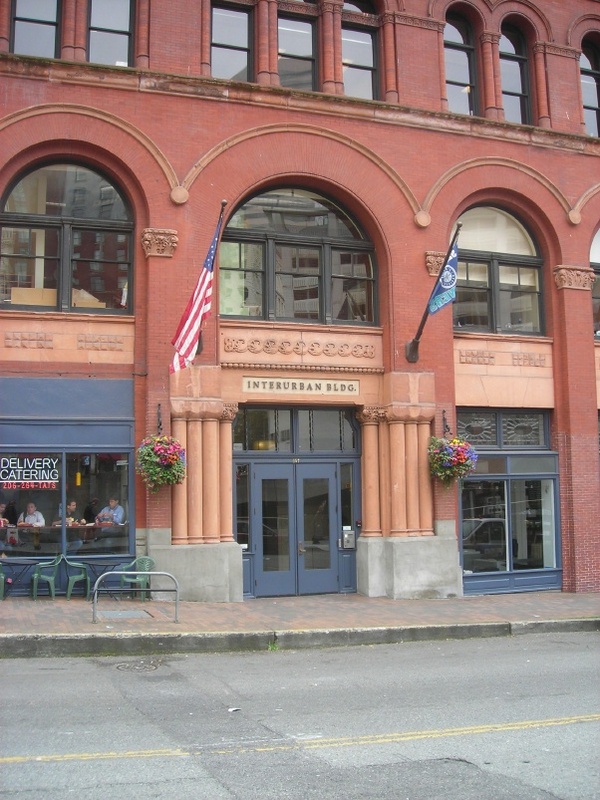 The doorway of Seatle's Interurban Building, at Yesler Way and Occidental Avenue. This was one of the buildings that went up after the Great Fire of 1889. 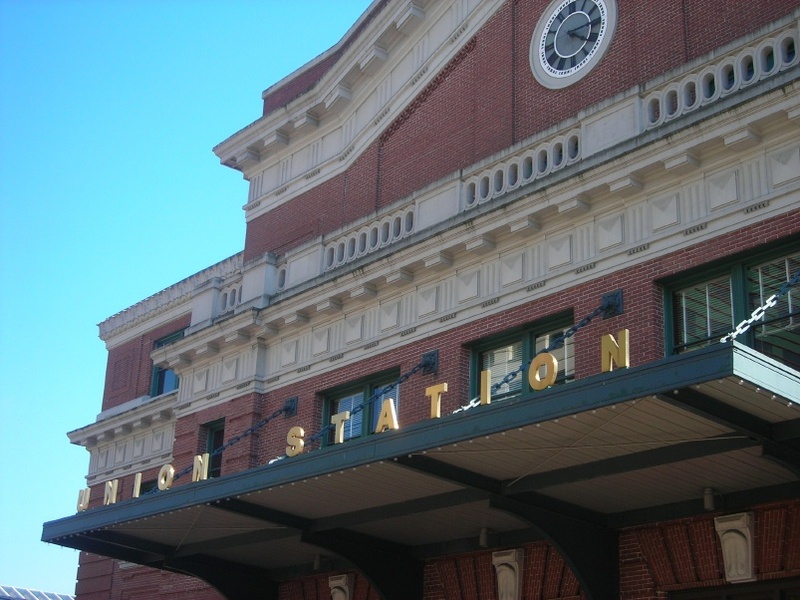 The Puget Sound Electric Railway had its offices in the building, giving it its current name. I took the photo on our visit in July, 2010. In September, 2008 the Giants unveiled their Wall of Fame along the King Street side of the ballpark, whatever it is called this week. 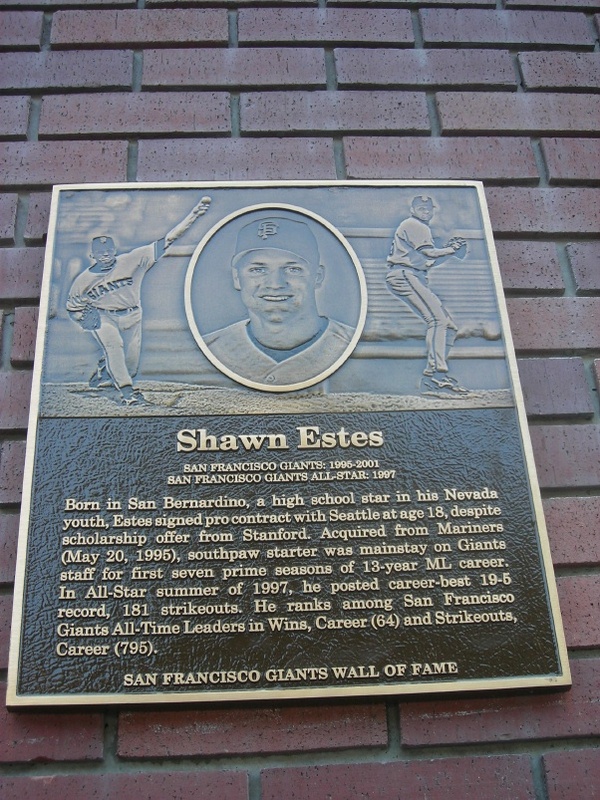 This plaque was added on 01-August-2010, to honor Shawn Estes. Estes was a good left-handed pitcher who had some hard luck. 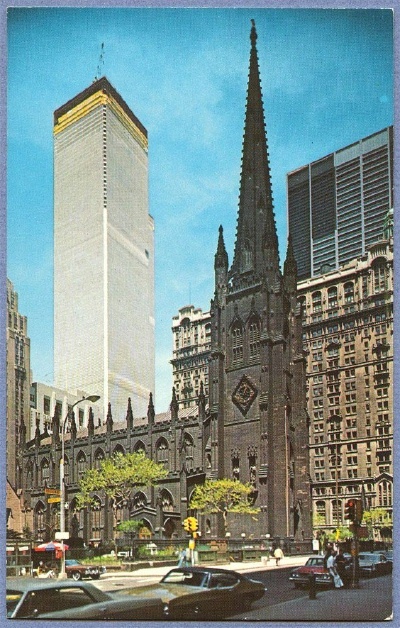 A view of Saint Paul's Episcopal Church with the towers of the World Trade Center being built in the background. The nine-year commemorations have been relatively quiet. A group of people was waving flags at the corner of Highway One and Linda Mar Boulevard. Today was warm and sunny. 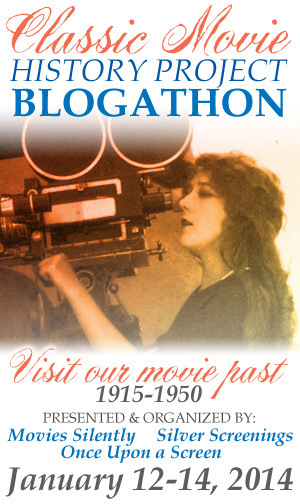 After Buster Keaton left MGM, where he had been stifled in a series of movies that started out pretty good (The Cameraman, Spite Marriage) and wound up pretty bad (The Passionate Plumber, What! No Beer? 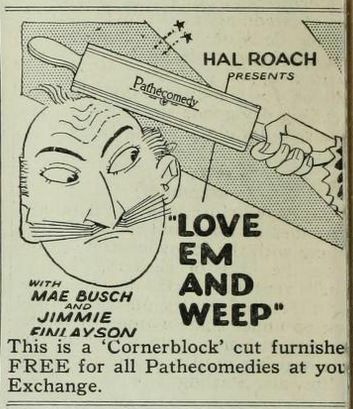 ), he signed up with Earle W Hammons' Educational Pictures, which had produced hundreds of short comedies over the years. 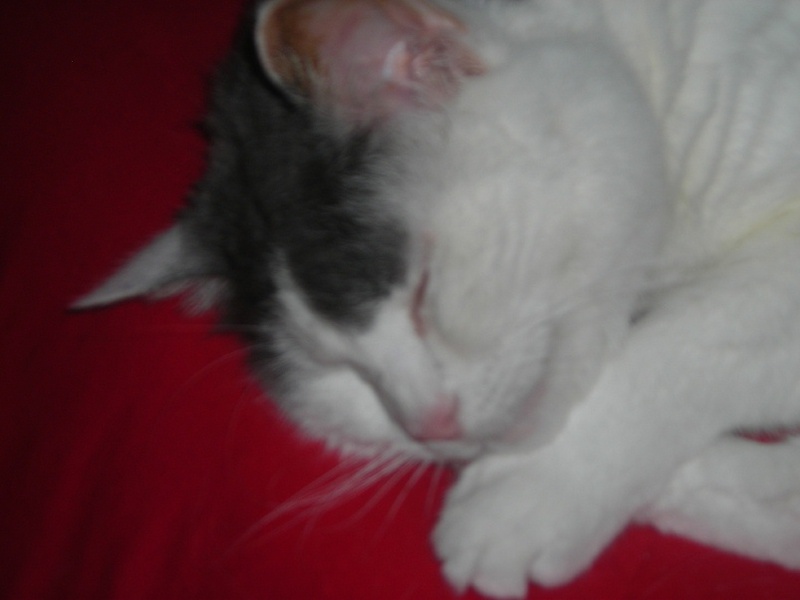 Educational gave Buster minuscule budgets but plenty of room to breathe. from 1934 to 1937, he made 16 two-reel comedies which I have been reading about for years, but had never seen till now. Most of the references were disparaging, but I still wanted to see the movies. They turned out to be enjoyable, far better than his Columbia shorts. 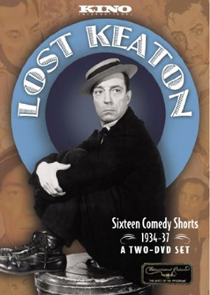 These movies reminded me of Roscoe Arbuckle's Comique shorts, which featured Buster. Two of the films, "Palooka from Paducah" and "Love Nest on Wheels," were hillbilly stories which featured members of the Keaton family. "Palooka" had his mother Myra, his sister Louise, and his dad, Joe. Joe had trouble with the dialogue. Myra and Louise had deadpans as firm as Buster. Myra was smoking a pipe, as she did in real life. "Love Nest" had Myra, Louise, and Buster's little brother, Harry, who had once been known as "Jingles." Charles Lamont directed most of the movies, and he seemed to know how to stay out of Buster's way and let him work. Mack Sennett directed "The Timid Young Man," but I didn't see anything of his style except for a shot of Lona Andre posing in a bathing suit. "One Run Elmer" had a baseball game that included many of the tricks he used in charity games. "Tars and Stripes" was shot on location on a naval base in San Diego. "Grand Slam Opera" was my favorite, including lots of dancing and a broom fight straight from the Three Keatons in vaudeville. 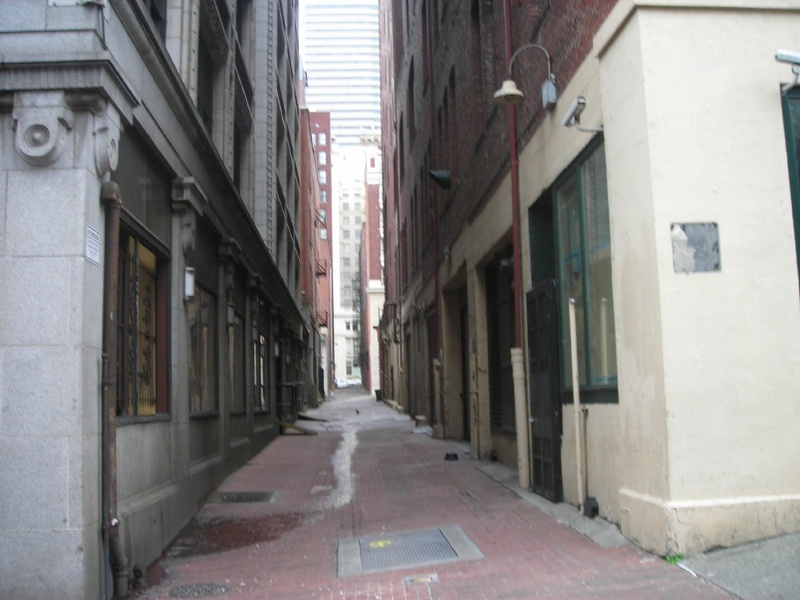 I can't find the name of this Seattle alley, either. The building on the left is the famous Smith Tower. We are looking north from Yesler. We had light rain yesterday in Pacifica. Tonight there is a big fire in San Bruno, near Skyline. Lots of helicopters and airplanes are flying over. Henry Van Der Weyde was a son of Doctor Peter Henri Van Der Weyde. After service in the American Civil War, Henry emigrated to England, where he became a pioneer in taking photographs using artificial light. 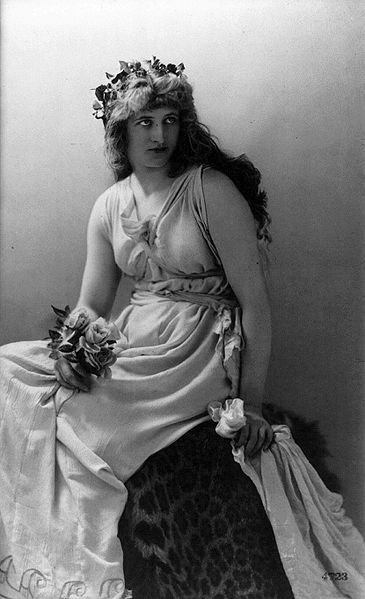 In this 1887 photo, taken in London, he shows American actress Mary Anderson as Perdita, daughter of Leontes, King of Sicily in Shakespeare's The Winter's Tale. It is from the collection of the Library of Congress. 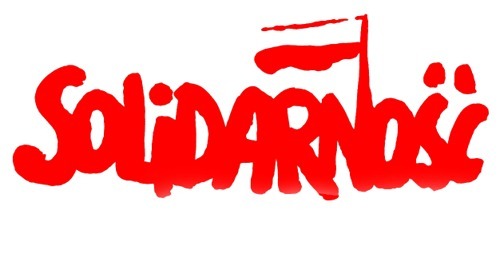 I remember in the early 1980s reading about an independent (non-Communist) labor union in Poland called Solidarity. It was influenced by Catholic social teachings. I figured they were doomed, but they persisted through persecution and martial law. They followed the One Big Union idea of the IWW. Eventually, they won. This is good to remember on Labor Day. 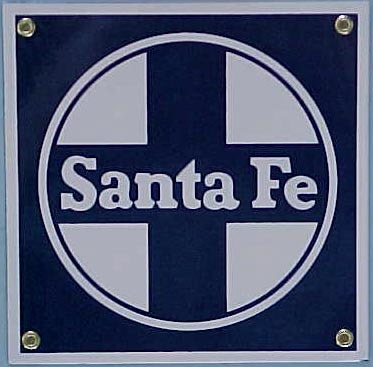 This metal sign carries the classic Santa Fe Railroad herald. 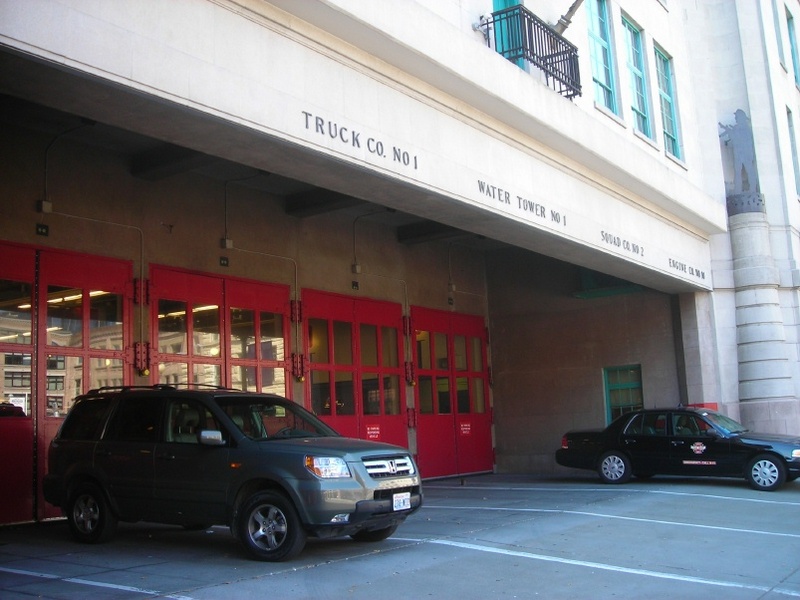 Former Seattle Fire Department Station 10 serves as department headquarters and houses a museum which was closed when we visited. The Museum is operated by the Last Resort Fire Department (http://www.lastresortfd.org/). I took the photo when we visited Seattle in July, 2010. Seattle's Union Station, right next to King Street Station (http://cablecarguy.blogspot.com/2010/08/train-station-25-august-5-2010.html), is a former train station, opened by the Union Pacific and the Milwaukee Road in 1911, which has been renovated and made into an office building. I took the photo when we visited Seattle in July, 2010. If you are looking for something to do this Labor Day weekend, I can recommend the Tenth Annual Washington Township Railroad Fair at Ardenwood Historic Farm Regional Park in Fremont. Every year, the Society for the Preservation of Carter Railroad Resources brings in a steam locomotive to join their regular horse-drawn rail operation. There are rides on steam- and horse-drawn trains and handcars. There is a large garden railroad display, and all the regular animals and farm equipment and the beautiful Patterson house. 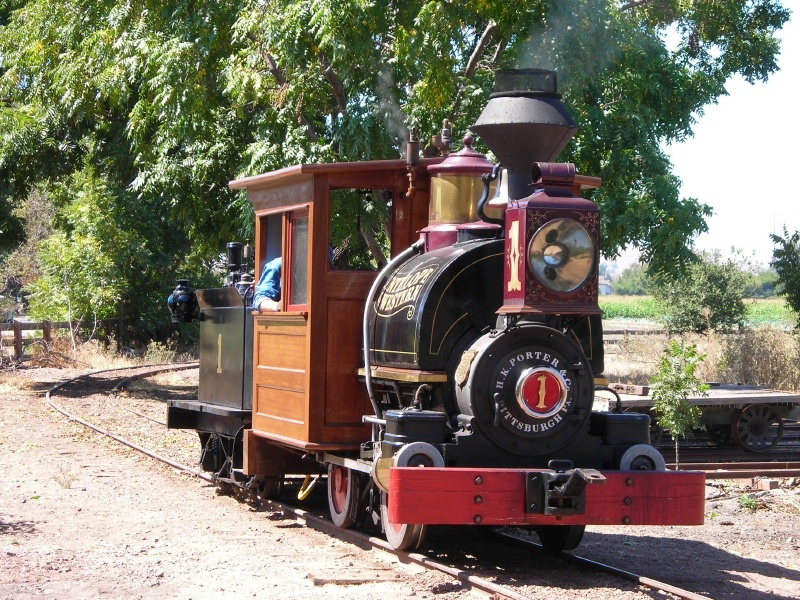 For the second straight year, there will be two visiting steam locomotives, 1889 Porter 0-4-0T, Antelope and Western 1, which visited 2005-2007, and 1890 Porter 0-4-0T, Cortez Mining Company 1, which visited last year. There were no horse-drawn train rides the last two years because Tucker died in 2008, and his replacement was not fully trained last year. This article appeared in the January, 1912 issue of Aeronautics. 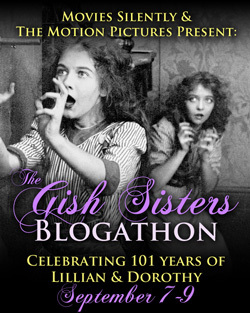 The comments of the film producers reflect the shift from actualities to dramatic films that was taking place around 1910. Author Israel Ludlow was a lawyer and early flier who lived until 1960. Lieutenant Henry Harley "Hap" Arnold was one of the first Army aviators, became Commanding General of the U.S. Army Air Forces during World War II and retired as a five star general. Lochinvar was a character in Walter Scott's "Marmion". Robert G Fowler was an early aviator who managed to live until 1966. Pilot Phillips Ward Page joined Naval Aviation during WWI and died in a crash in 1917. DURING the aviation meet at Nassau Boulevard, it became one of my official duties to the corporation, which was promoting the Meet, to dispose of the motion picture rights. In spite of extra efforts, no bid whatever was obtained from any of the various film manufacturers throughout the country. Knowing that such picture rights have been sold in the past, a natural curiosity was excited to discover the reason of the present failure. It was found that the business of taking motion pictures had enormously developed within the past two or three years, and had formed definitely on certain lines from which the manufacturers were unwilling to deviate. A very profitable market, and practically the only market for the films, were the five and ten cent motion picture theatres throughout the United States. It is reported that there are over ten million people who attend these theatres daily, and this public demands not a scenic or educational picture, but rather a photo play which shall have some dramatic climax, or which shall entertain the spectators by its comedy features. The motion picture manufacturers have grown wealthy catering to the public along these lines; and they declared that a simple picture of one or more aeroplanes flying in the sky attracts no more than a picture of an express train or the race of a fire engine down the street, because the human element is lacking. The owner of one of the great film factories very frankly told me in detail of this situation, and as a result of the friendship thus formed, he suggested that I write a scenario or two in which the aeroplane played a part, and engage the aviator, and his company would produce it. His offer was a very generous one, and I wrote two scenarios which were enacted before the motion picture camera on the aviation field at Nassau Boulevard, immediately following the Meet. Lieutenant H. H. Arnold, U. S. A., played the leading part; that is, he was the aviator and substituted for the actor when the actual flying was necessary. A leather coat, knickerbockers, puttees, and goggles gave actor and Lieutenant very much the same appearance, and the audience which subsequently saw the pictures projected on the screen, probably never detected the difference. The plays had strong simple situations. Their titles fully suggest their plots; "The Elopement" was the story of a young Lochinvar who runs away with his lady-love in the aeroplane. "The Military Airscout" was about a brave officer who succeeded in delivering a message to the Commanding General, though his aeroplane was brought down by the aeroplane guns of the enemy, and he was badly hurt in the fall. Other stories: "The Red Cross Nurse", "The Aviator's Success", "Aviator and Automobilist", etc., followed. Not satisfied entirely with work of this character, and recognizing the scientific possibilities of the combination of the aeroplane and the motion picture camera, the Aviation Film Company was organized. This Company put Robert G. Fowler, the cross-continent aviator, under contract to carry a camera on his aeroplane from Texas to New York. The unique qualities of a motion picture taken from an aeroplane were so striking that little difficulty was experienced in making a contract between this Company and a great film concern, which is a member of one of the big sales organizations that have an exclusive contract for the disposal of films to the exchanges, who in turn deal directly with the exhibitors. Mr. Sexton, and Mr. E. R. Shaw, a camera man, joined Mr. Fowler at Beaumont, Texas, where on December 17th, 1911, the first aeroplane picture in America was made. 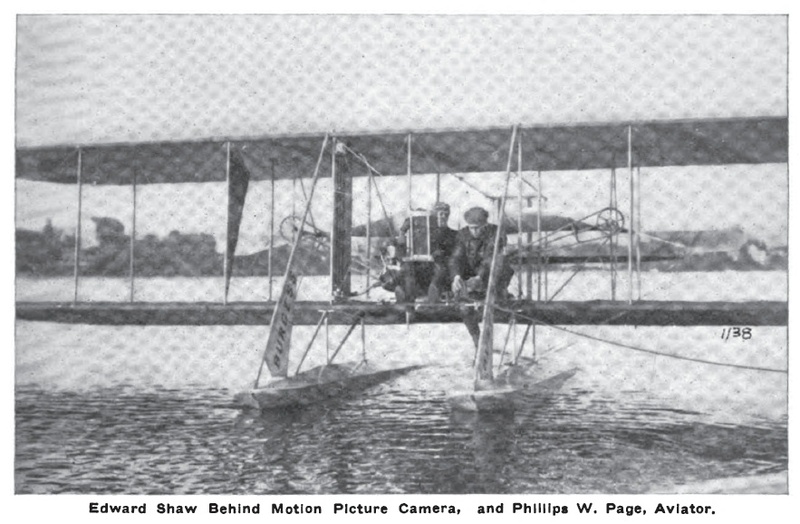 Mr. Fowler's contract with us required him to carry Mr. Shaw as passenger, with camera, or in place of Mr. Shaw, an automatic device which would turn the crank of the camera with power transmitted directly from the aeroplane motor. This device was the joint invention of Mr. Robert L. Baird and myself. It was obvious that such a mechanical instrument had economical qualities of great value. It would save the weight of the passenger, and thus gasoline equal in weight could be carried, insuring longer flight, and one life instead of two would be risked. Mr. John G. Hemment, a professional photographer, Mr. Frank S. Lusk, and the writer went to the Burgess Co. & Curtis' aeroplane factory, where with their assistance, on December 21st, 1911, a mechanism was perfected and successfully tried on a hyrdo-aeroplane, at Marblehead, Mass. The device was the result of ten days' or two weeks' experiments, and its value is so great in our minds that it is being patented in behalf of the Aviation Film Company. The device has its possibilities in connection with making a topographical survey of the country for railroads who may want a map of a route to be covered by a proposed line, and on a scouting expedition the military aviator could carry sufficient film to cover his flight, no matter of what distance (this exceptional length of film being one of our improvements over the ordinary camera) and within a few hours the films can be developed and projected on the screen, greatly magnified. The telephoto lens would probably also be added, enabling the aviator to fly at any height. Photographs can also be made when desired, which will not overlap but which join or abut on each other. Examination of these latter pictures, of course can only be made one at a time, but their value is unquestionably great, for the result of any scouting expedition, even hundreds of miles in length, would be certain and exact. 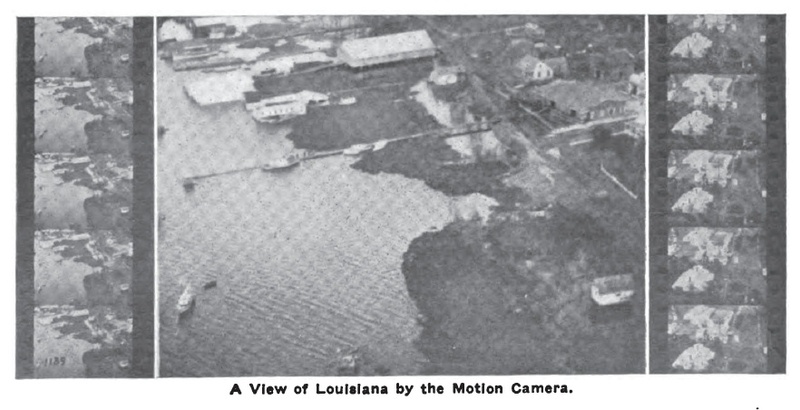 During the first flights at Marblehead, the camera was operated by hand, but for the continuation of the experiments the camera was geared to and run by the motor. By means of a switch attached to one of the uprights, aviator Phillips W. Page was able to start the film revolving and stop it at the completion of a picture. So far as is known, this was the first time in this country that an aviator has taken motion pictures unassisted. On the following day Page took up Hemment, who has recently returned from a hunting trip in Africa, with Paul Rainey, adding a new sensation to his list of experiences of pursuing game with his motion camera. Flying over the bay at a height of 150 feet, the aeroplane gave chase to a flock of wild ducks, and, after some maneouvring, the ducks were brought within range of the lens. Development of the films showed the pictures did not suffer from the motion of the aeroplane.